HAPPY NEW YEAR! 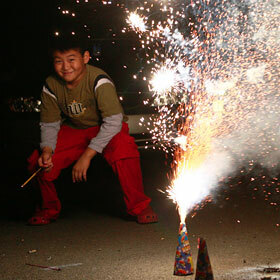 » George Lu, 9, peered from behind fireworks he set off in Palolo Valley yesterday evening. Lu was celebrating with his parents, Andrew and Kathy, and his brother, Jonathan. With the elections over, officials expect the Legislature and the governor to build on compromise. Consumers rush to beat excise and gas tax increases today. A new maestro faces a lion. ABC's next 'Bachelor.' Restaurant stars plan openings. Warriors should find out soon what's ahead. Wallace leaves some big shoes to fill. Kai seeks shot to play on 'World' stage. Airline drama to play out. Real estate boom cools off. Inflation curbs euphoria over tourism, jobs data. The Star-Bulletin asked readers to send us their thoughts, ideas and hopes for 2007.